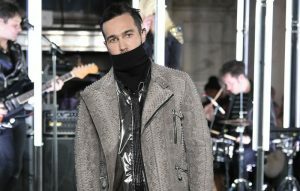 Fall Out Boy‘s Pete Wentz modelled at New York Fashion Week earlier this week. The bassist made his debut on the catwalk during a show at the much-publicised fashion festival on Monday, appearing for designer Philipp Plein’s marquee event. Wentz joined fellow musicians-turned-models Desiigner, Young Thug and Fetty Wap on the catwalk, in an event that Plein termed as ‘Make New York Fashion Week Great Again’ – referring to President Donald Trump‘s victorious campaign slogan. See an image of Wentz on the catwalk below. Wentz sat down with NME late last year around the release of Fall Out Boy’s live concert film, Boys Of Zummer Tour: Live In Chicago. Wentz agreed that the Chicago show had completed the band’s comeback, saying: “We thought we’d be able to come back and play clubs and theatres, so to be able to come back and play a big outside show was pretty cool, especially in our hometown. It felt like the culmination of a long process. Fall Out Boy last released an album, ‘American Beauty/American Psycho’, in January 2015. The post Fall Out Boy’s Pete Wentz becomes catwalk model at New York Fashion Week appeared first on NME.